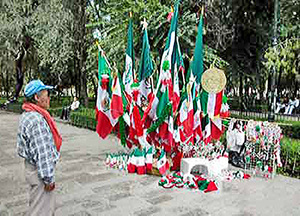 Street vendors hawk la bandera nacional (the Mexican flag) in dozens of forms for several weeks during August and right up to September 16, Mexico's Independence Day. It's always fun to see what's the latest in patriotic tchotchkes. In this photo, you see a vendor near the zócalo (Plaza de la Constitución) in Mexico City. Photo courtesy Starmedia. Another flag vendor, this time in Morelia, Michoacán. All photos copyright Mexico Cooks! unless otherwise noted. Hundreds of books have been written about Mexico's break from Spain, millions of words have been dedicated to exploring the lives of the daring men and women who knew, more than 200 years ago, that the time had come for freedom. You can read some of the history on the Internet. Another excellent source for Mexican history is The Life and Times of Mexico, by Earl Shorris. You'll find that book available to order through Amazon.com, on the left-hand side of this page. But the best-kept secret in Mexico is the Independence Day party. No, the biggest deal is not on September 16th. 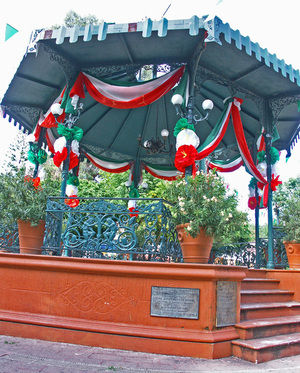 Held every year on the night of September 15, the Gran Noche Mexicana (the Great Mexican Night), the real celebration of the revolutionary events in 1810, is a combination of New Year's Eve, your birthday, and your country's independence festivities. Wouldn't you really rather hear about the party? I knew you would! For years I've attended the September 15 celebrations in a variety of towns and cities. In Mexico City, the country's president leads hundreds of thousands of citizens in late-night celebrations in the zócalo, the enormous square surrounded by government buildings and the Metropolitan Cathedral. Every Mexican town big enough to have a mayor holds a reenactment of the Grito de Dolores, Hidalgo's cry for independence. The town square is decorated with flags, bunting, and ribbons. Cohetes (sky rockets) flare and bang. Sometime around eleven o'clock at night, the folks, assembled in the town plaza since nine or so, are restless for the celebration to begin. The mayor's secretary peeks out from the doorway of the government offices, the folkloric dancers file off the stage in the plaza, the band tunes up for the Himno Nacional (the national anthem), the crowd waves its flags and hushes its jostling. The mayor steps out onto the balcony of the government building or onto the stage built just outside the building's front door to lead the singing of the Himno's emotional verses. The bandera monumental and celebratory fireworks in front of Mexico's Palacio Nacional, the zócalo, Mexico City, September 15, 2015. Photo courtesy press. 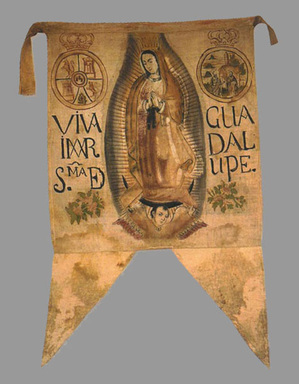 Father Hidalgo's 1810 banner. He carried this banner as his standard as a leader in the fight for Mexico's independence from Spain. Photo courtesy Pinterest. Later there will be dancing and more music, and food, including traditional pozole, tostadas, mezcal, tequila and beer, and, in larger towns and cities, all-night revelry in the plaza, in private homes, and in hotels, restaurants, and events halls. 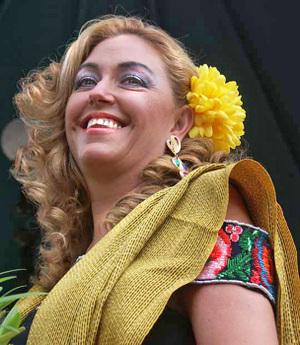 A number of years ago my friend, música ranchera singer Lupita Jiménez from Guadalajara, invited me to a Gran Noche Mexicana where she was performing. The event was scheduled to start at 9:30, but Mexican custom normally dictates late arrival. By ten o'clock I was on my way to the party. At the salón de eventos (events hall), the parking lot was already full, but a man was parking cars on the street just a block away. As I left my car, he said, "Could you pay me now for watching your car? It's 20 pesos. I'll be leaving a little early, probably before the event is over." "Till six o'clock." My jaw dropped and I handed him the 20 pesos. Six in the morning! Surely we wouldn't party quite so long as that! The sad truth is that I didn't. I couldn't. My stamina flagged at about 3:00 AM, after dinner had been served at 10:30, a city politician had proclaimed the Grito, the Himno Nacional had been sung, and big noisy fireworks had been set off on the indoor stage (I swear to you, indoors) of the salón de eventos. Then the show started, a brief recapitulation in song and dance of Mexican history, starting with concheros (loincloth-and-feather-clad Aztec dancers) whirling around a belching volcano, and ending with the glorious jarabe tapatía--the Guadalajara regional dance that most speakers of English know as the Mexican hat dance. 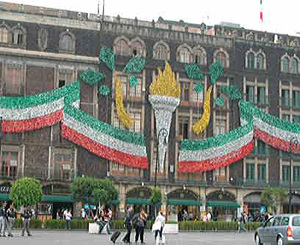 The Palacio Nacional (national office building, including the president's offices) on the Zócalo (Plaza de la Constitución) in Mexico City, all dressed up for the Fiestas Patrias.